Penicillin allergies are the most common drug allergy and a common cause of skin rashes, but it is hard to know if that is what is causing his rash. It might be caused by something else. A penicillin allergy can cause life-threatening allergic reactions, but fortunately, most kids with a penicillin allergy have more mild reactions, leading to simple skin rashes, such as hives. In addition to hives, children with more severe symptoms, such as wheezing, difficulty breathing or swallowing, or swelling in their mouth or throat, may have anaphylaxis – a serious allergic reaction. 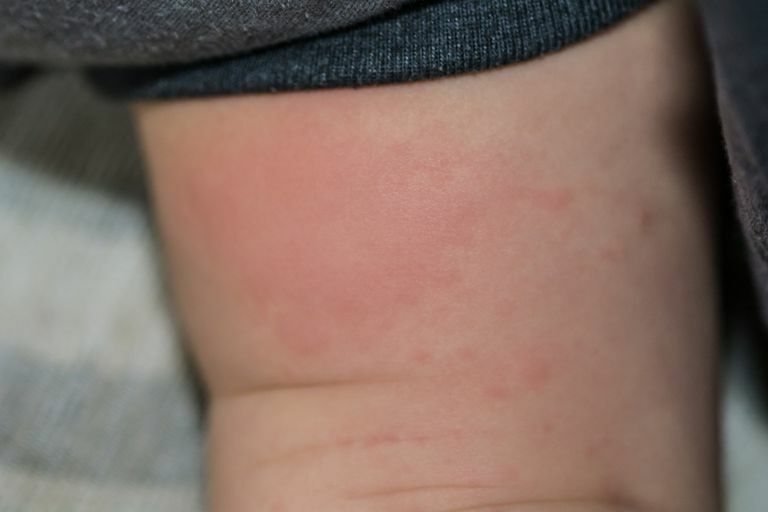 If your child just has hives (also called urticaria), you will likely notice red or pink raised areas on your child's skin that are itchy, varied in size, and come and go over several hours. They often don't go away completely, though. Instead, older hives go away in one part of your child's body, while new ones continue to appear somewhere else. Any individual hive shouldn't last more than 24 hours. If it does, then your child may have a similar skin rash, such as erythema multiforme, and not simple hives. Erythema multiforme is a type of allergic reaction that can also be caused by a penicillin allergy or things like other drugs, bacterial infections, or viral infections. Unlike hives, which come and go, the rash from erythema multiforme usually continues to spread and may last for one to two weeks. Other symptoms of erythema multiforme can include fever, joint aches, mouth sores, and red eyes. Is It a Penicillin Allergy? Unfortunately, penicillin allergies can be harder to diagnose than most parents can imagine. For one thing, there is often the confusion as to whether a child is actually having an allergic reaction or simply has a viral rash. Roseola, for example, is a classic viral infection that causes a fever for several days that is followed by a rash once the fever breaks. There are also some drug reactions that can cause rashes that are not antibody mediated. These cell-mediated, delayed hypersensitivity reactions often occur when the child is taking an antibiotic and also has a viral infection. This type of morbilliform drug rash may be itchy as is often described as "widespread pink- to salmon-colored macules and papules that usually start on the head, neck, or upper trunk then spread symmetrically downward and become confluent". In addition to stopping the penicillin that might be triggering your child's allergic reaction, your child will likely be treated with an antihistamine, such as Benadryl (diphenhydramine), to relieve symptoms of hives and itching. More severe reactions may need to be treated with steroids and/or an epinephrine injection. If your child is allergic to penicillin, then he should also avoid amoxicillin, Amoxil, Augmentin, and any other penicillin-like antibiotics. Most experts think that kids with an allergy to penicillin can take cephalosporin-type antibiotics although there is a small risk of having an allergic reaction to this type of antibiotic, too. Although an allergic reaction may be triggered within minutes to hours of taking a dose of penicillin, it may take days or weeks for an antibiotic to trigger hives in your child. Also, your child may have taken the antibiotic and not had a reaction before, and then suddenly has a reaction the next time he takes it. Remind your pediatrician if your child is allergic to penicillin whenever you get a prescription. Although they likely have an 'allergy warning' in the child's chart, it is good to be safe and give them a reminder. Antibiotics should be prescribed only in very specific circumstances. Antibiotics should not be given "just in case" the child needs them, or for any straightforward viral infection, as this can lead to unnecessary side effects and complications. Most importantly, keep in mind that many parents think their children are allergic to penicillin when in fact they aren't. A pediatric allergist can help to figure out if your child is really allergic to penicillin. Behrman: Nelson Textbook of Pediatrics, 18th ed. Can Food Allergies Trigger Eczema in Your Child?